Detailed and actionable feedback is vital for making changes and improvements in Windows 10. Your feedback helps Microsoft gauge product satisfaction and build quality, and is instrumental in guiding conversations about which changes to make within the operating system. To provide feedback, simply visit the Feedback Hub app in your Start menu. 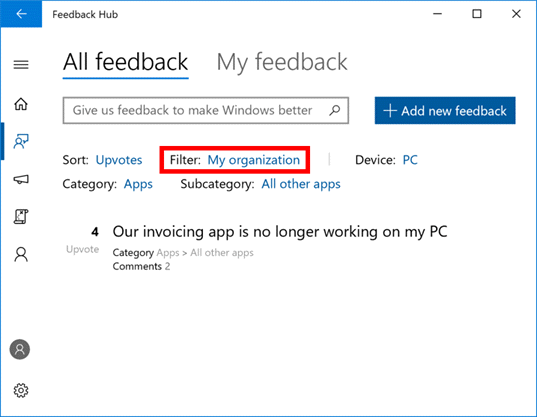 When providing feedback in the Feedback Hub, please review "Send feedback to Microsoft with the Feedback Hub app" and consider the following tips. You can also use the Language Community App to help us make Windows better in your language (PC only). Another user may have already shared the same feedback. If they have, please “upvote” the existing feedback instead of creating a duplicate submission and add comments that provide clarity to existing information or add scenarios to review. When sharing feedback, logs and system settings may be collected depending on the type of feedback being submitted. For example, we may not be able to address a cellular data bug that gets filed against the Health application because we would not receive the correct logs. Providing feedback one item at a time ensures the correct logs and data are received with each submission. When sharing additional details, it is important to provide as much detail about the issue as possible. For example, include steps to reproduce the issue, attach screenshots (if applicable) and use the “reproduce issue” option, if available for the type of feedback being submitted. Sharing additional information is extremely helpful in describing the issue and showing details of the experience being reported. There are several ways to do this: attach a screen shot, attach a file (such as a dxdiag, .cab files, or other) and/or recreate the problem (Capture Mode). If you’re able to reproduce the issue, then Capture Mode is extremely helpful because we can capture detailed logs while the issue is happening. Capture Mode is an important method of bug re-creation that provides detailed logs for Windows engineering teams to review. To use this process, follow the steps below. Click “Stop Capture”. You’ll see a note that the log files are now attached to your feedback. Submit your feedback item. All appropriate logs and data will auto-attach to your submission. Navigate to the Feedback tab. Search for and navigate to the feedback item you’d like to share. If looking for feedback you have created, click the My Feedback tab at the top. After selecting the proper feedback item, click the Share button in the upper right corner. A small window will display with the newly created link. Go to Feedback, All Feedback. Under the Filter drop-down, select My Organization to view feedback from Insiders in your organization. Note: Feedback filtered with this view will only show Feedback from users in your organization who sign into the Feedback Hub using their registered work account in Azure Active Directory. Our Language Community App makes it quick and easy to suggest changes to Windows text translated in your language. Simply click on the text you want changed, enter your suggestion or vote for suggestions from other Windows Insiders and submit. Available for PC only. Requires Insider Preview build 16299 or above. Check Store description for languages supported. Use Windows displayed in your language, not in English (United States). Check your Windows display language at Region & language in Settings.